Pictured left to right—March 26, 1950—S.V. Aldridge, Leon Aldridge, Jr. (author) and Leon Aldridge, Sr.
There’s something alluring about railroad tracks. Steel rails supported by wooden cross ties have beckoned to our curiosities and provoked the muse within us since the Golden Spike tying both sides of the continent together with rail service was driven. Photographers use them for portrait backgrounds; a generation of movie makers used them employing villains tying maidens in distress to the tracks, only to be foiled by the rescuing hero; and who among us has never stopped to gaze at the vanishing point on the horizon where the two rails converge, fantasizing about where the steel ribbons at our feet might lead us? For me, it’s the sense of smell that does it. The strong, peculiar creosote odor on cross ties sends me back 60 years in time to Pittsburg, Texas where my dad’s parents lived and conjures up memories of my grandfather. S.V. Aldridge worked for the railroad, the Cotton Belt as it was known then. He was born in 1888, and began a lifelong career with his first full-time job working for the railroad at the age of 13. He retired in 1954, about the time I entered first grade in Crockett, and memories of my early summers spent at my grandparent’s house are indelibly linked to the distinct smell of creosote. Even in retirement, my grandfather was still a railroad man. He delighted in taking me to the Pittsburg depot to watch the telegraph operator. The depot itself smelled of creosote, and the “rat-a-tat” rhythm of Morse code hammered out on a used Prince Albert tobacco can provided background music for the identifying aroma. A special treat was the rare occasion on which he would mount the rails with the motorcar he rode for years as a section foreman and we would indulge in a short, open-air ride on the tracks. I used to think it was something he did to entertain me, but I still remember the smile on his face as well. My grandparents lived across the street from the Cotton Belt track just a few blocks from the depot. We’ll never know, but I suspected in later years that buying a house right across from the street from the tracks might not have been a coincidence. 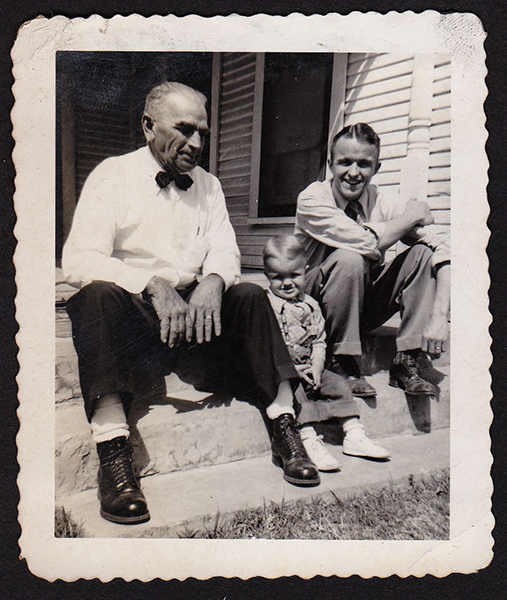 For as long as he lived and was able to sit on the front porch in his rocking chair, my grandfather checked every passing train against his pocket watch and commented as to the rumbling freight train’s schedule. “Looks like the 5:15 is right on time,” I can still hear him comment. They moved into the house at 323 Cypress Street in Pittsburg on Halloween night in 1930. My father was seven years old. My grandmother was living in the same house when she died in October of 1993, almost 63 years later to the day, and 26 years after my grandfather’s death in 1967. Even then, it still looked pretty much as I remembered it as a child from the early 1950s. I thought about my grandfather when the railroad phased out cabooses in the 1980s in favor of a single small red ”tail light” on the last car, wondering what he would have thought about that. Even today, I still think a train without a caboose looks strange. Sort of like a sentence without a period. A book without a conclusion. A sermon without a closing hymn. And, smelling creosote without my granddad around still leaves me with the feeling something’s missing. Maybe it’s the same feeling we get looking at railroad tracks and thinking about places we’ve been, or places we would like to go—the mystery of touching a link to destinations unknown. Or, maybe it’s just remembering my grandfather looking at the pocket watch in his hand as the 5:15 rumbled through Pittsburg. Originally published in the Naples (Texas) Monitor, February 1999 and reprinted in the Mount Pleasant (Texas) Daily Tribune and The Center (Texas) Light and Champion, September 2014. Thanks Frankie. Truthfully, starting the blog was not only to keep my writing skills in tune, but posting the previously published pieces along with new ones is an exercise to see if I can get enough ducks in a row to compile a book of the better ones. My daughter has suggested more than once that I do it, so we’ll see what happens. I have read this one a few times before but I never tire of reading it again. Probably because I knew your Grandmother so well. She was a treasure (that, and she would let us borrow her ’57 green Ford). I too must confess liking railroad tracks and the smell of creosote but, I also like the smell of diesel fuel and racing gas. I think we are slightly weird. I’m pretty sure we confirmed the weirdness factor a long time ago. As you know, I still have Granny’s green ’57 Ford. I have a draft copy written for a column on “Liz,” her name for the car. Might be a good time to finish that one up and publish it.